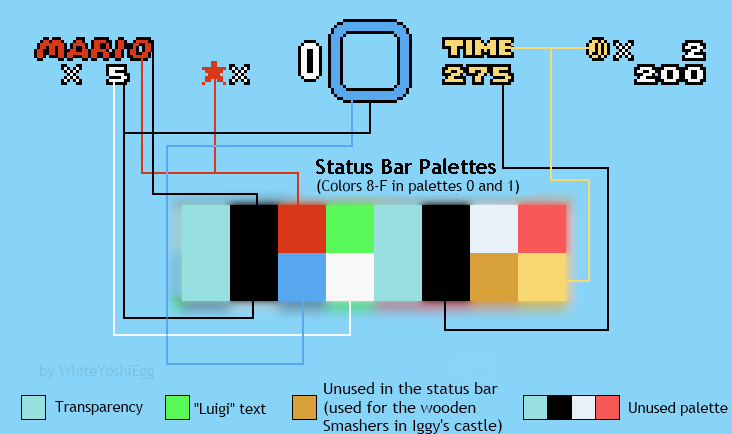 Tip: When using custom palettes, remember that certain colors in palettes 0 and 1 will also affect the status bar. Not logged in. Posted on 2013-12-02 10:37:14 PM in Random Mario sprite under my username? Sorry - I'm new to this site. I did a look around and saw that a lot of users have a random animated sprite under their username. I have a flopping Cheep-Cheep. Why are these sprites there and can I change mine? Posted on 2013-12-02 10:44:40 PM in Random Mario sprite under my username? Posted on 2013-12-03 02:58:41 AM in Random Mario sprite under my username? I will! Thank you for the warm welcome and the info! You know the legend on the top of the page? Where do I actually find these shortcuts in the music files listed? If I hover over "info", I only get a description of the song. 1. Can I get email notifications from these forums when someone has replied? How? 2. Can I change the color of my username? I've seen people's usernames in dark blue, pink, gold, etc. 3. What is the daily lottery here? I couldn't find any info on it. How does it work and what kind of stuff can be won? Yeah, I was just scrolling through my profile settings and found a section where you could input a number to participate in the daily lottery. No other information about it. Interesting. Actually, I would want to get emails. I find it easier than remembering to check back on each of my threads. Oh well. No, I have a separate section in my email for forum replies. They really wouldn't get obtrusive for me. Plus most forums offer the ability to turn off notifications on a certain thread (if it's popular). Posted on 2013-12-18 11:05:57 PM in Can I make requests here? I was wondering if there's a specific forum on this site that I can request something in, like a custom block or song, if anyone is willing. I will try to learn how to program them soon, but right now I have no idea. Posted on 2013-12-19 02:25:03 AM in How do I find all the threads I ever posted in? Do you know if there is any way to sort them so newest posts are on top, listed first? I didn't supply a MIDI because I have no experience in doing so or software to do it with. Plus the song is very simple anyway. If a MIDI is absolutely necessary, I will be glad to figure it out for you. I'd like it to sound as close to the original as possible to maintain the eerie atmosphere. Also, you don't have to send me a .spc file with the final product. I can play the song directly from the .txt file. YOU WILL BE GIVEN CREDIT IN MY HACK IN THE LEVEL I DECIDE TO USE IT IN. EDIT: If this song could be compatible with AddMusic 4.05 and not sampled, that would be great. Posted on 2013-12-19 03:43:36 AM in Can I make requests here? Just what I wanted. Thank you! Let's say I wanted to type "A SMW hack". I don't know whether to use A or AN. If you expanded SMW into SUPER MARIO WORLD than A would make sense. However, since S's name begins with a vowel (ESS), in speaking you would use AN. Which form is proper in writing? Posted on 2013-12-20 03:28:34 AM in What do you guys think of my first level? Hello everyone. I made the first level of my hack and I would like to get your opinions before moving on. I've included a .ips with only my first level of the hack. -The overworld and title screen is not what it's going to look like in the final version. I didn't get to editing them yet. -I had to put this level into a different file in order to share it with you guys. The file I'm editing is all broken apart. So that means that this level will have custom music. I just didn't use AddMusic on this new file because I didn't feel like it. -With that being said, the overworld might have custom music, too. Posted on 2013-12-20 03:39:41 AM in What do you guys think of my first level? I said it WILL have custom music. My original file has music, but I copied the level from my actual hack file and pasted it into a new one just for quick upload. Since I didn't use AddMusic on my new file, there's no custom music. When the full hack is released, there will be. Sorry about the confusion.